More than 75 percent of the winter strawberries in the United States come from Plant City, Florida. The town is grateful for its strawberry bounty, and celebrates every spring with the Florida Strawberry Festival. This festival is very popular and ranks in the Top 40 of all fairs in North America. The next scheduled festival is March 2 - March 12, 2017. 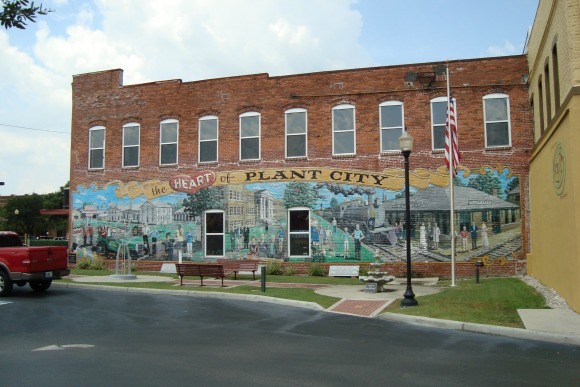 It's a great opportunity to visit Plant City and see what one small town has done to preserve and celebrate its history. 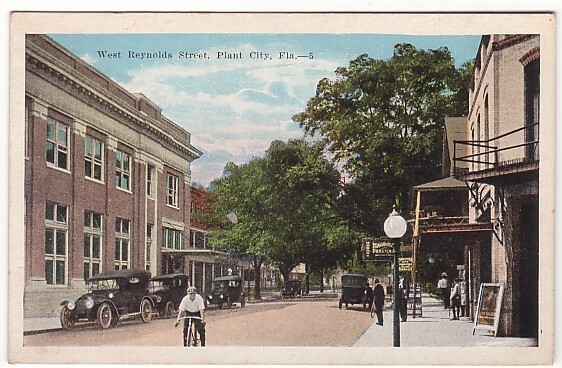 Many people assume that Plant City got its name from its agricultural activities. Actually, the town is named for Henry Plant, a railroad pioneer who did for central and west Florida what Henry Flager did for Florida's east coast. In the 1880s, Plant bought railroads and extended them into then undeveloped Florida, opening up the area to agriculture including not just strawberries, but blueberries, citrus and whatever the Florida soil could produce. Plant's railroads made it possible for Florida farmers to ship their products directly and cheaply to northern markets. Plant's railroad came to Plant City in 1884, and the community was immediately named for him. 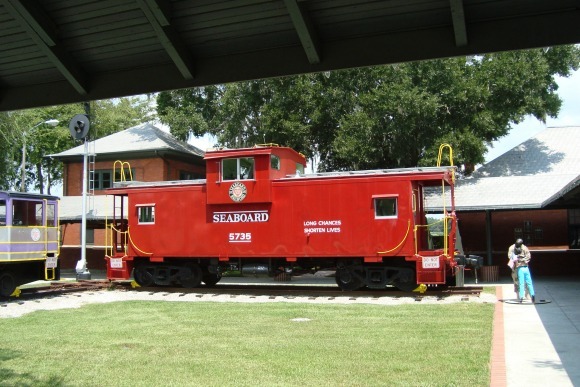 The railroad's contribution to the community is celebrated in a lovely new museum in downtown Plant City. Another amazing feature of the downtown area is the statuary. For example, the soldier and the woman greeting him at the station are realistic statues. Statues of people in various poses are scattered throughout downtown, and give you the feeling that you are not alone. Even if there are few real people on the streets, you will still feel like you are one person of many. 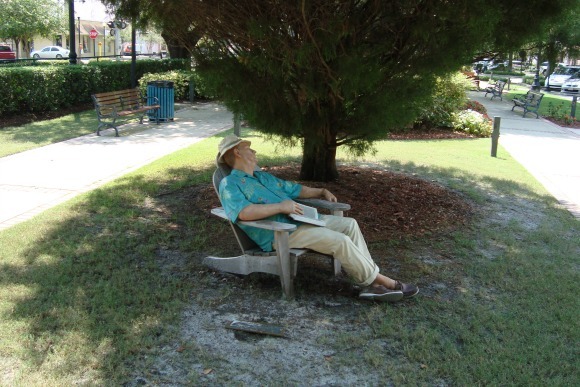 When I first saw the statue of the man sleeping, I thought he was real. After I took the photo I got closer to him and realized he was a statue. Plant City's downtown area is a great place to visit. There are many gift shops and antique stores and quite a few good restaurants. It's easy to spend an entire day just browsing the numerous shops. The community has done a wonderful job sprucing up and restoring old buildings that are being put to good use today. 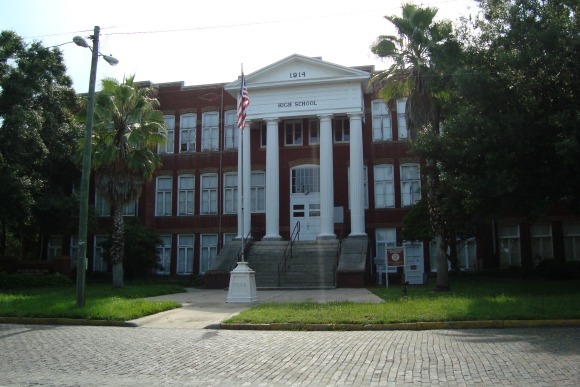 Even the old Plant City High School, built in 1914, is still standing and is in pretty good condition. 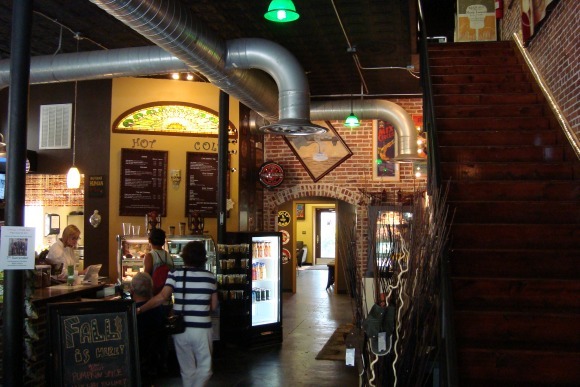 Krazy Kup is billed as an authentic coffee house. It is in a beautifully restored building in downtown Plant City, and is a sight to see just for the decorations and friendly atmosphere. Like many coffee houses, it has comfortable lounging areas where you can sip coffee and cruise the internet with their wifi connection. They have an impressive selection of coffees, espresso, tea (organic herb tea and chai) and chocolate drinks. In keeping with their name, their coffee is called Koffee. The menu includes a lot of "grab-n-go" items catering to the busy lunch crowd. These include various energy bars, wafers, chips, moon pies, potato crisps and Ghirardelli chocolates. If you like pastries, this is the place for you. They offer biscotti, butter crumb cake, brownies, cinnamon rolls, cookies, croissants and cheesecake. Smoothies and protein shakes are also on the menu, and so is shaved ice. The menu includes two different wraps: a grilled chicken wrap and a Mediterranean wrap. These are great wraps; I enjoyed the chicken wrap for lunch. It came in a flour tortilla (sturdy, which I like) and was stuffed with grilled chicken, rice, bean sprouts, angel hair cabbage, red pepper, tomatoes, cheese, romaine lettuce and pesto. I didn't even use a dressing; it was delicious without it. 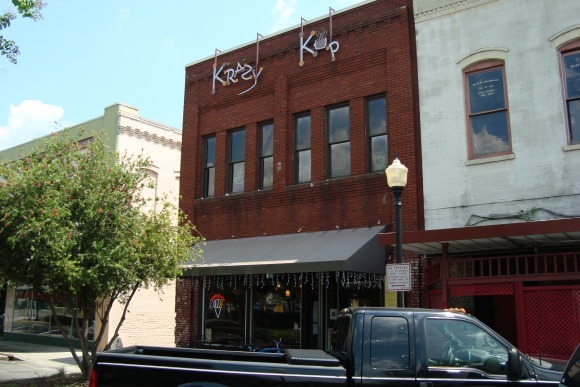 Krazy Kup also has a spacious upstairs loft where they host a lot of community gatherings including musical performances. More information is avaialable about this on their website. Owners Wenda and Frank Trunzo are doing a great job with this little place that opened in October 2013. I forgot to ask them about their unusual operating hours: They are open Tuesday - Friday from 8:13 am to 8:13 pm, and Saturday from 10:33 am to 10:33 pm. They are closed on Sundays. Try this neat little place; you will like it.